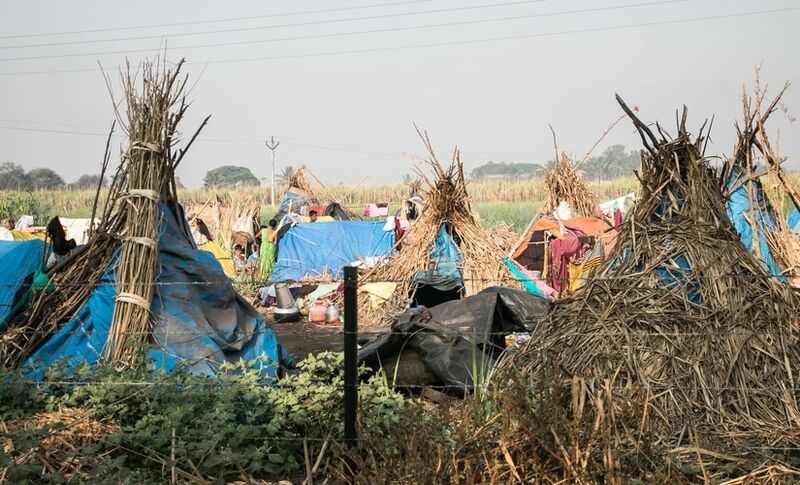 It’s the last week in the six-month cycle of seasonal migration and Damini Jadhav, 13, is anxious to return to her village Dahiphal in Maharashtra’s Beed district. Her parents are migrant agricultural labourers, who spend October to March each year traveling between villages in western Maharashtra and Karnataka cutting sugarcane. “Now, I’ve decided not to leave the village till I give my class X board exams,” she says. Her school teacher had called her parents twice to get her to sit for the year-end exams, but she couldn’t make it. “The teacher will make someone else write my paper and will promote me to the next class,” she says. She says she can’t comprehend written Marathi because of missing regular classes. 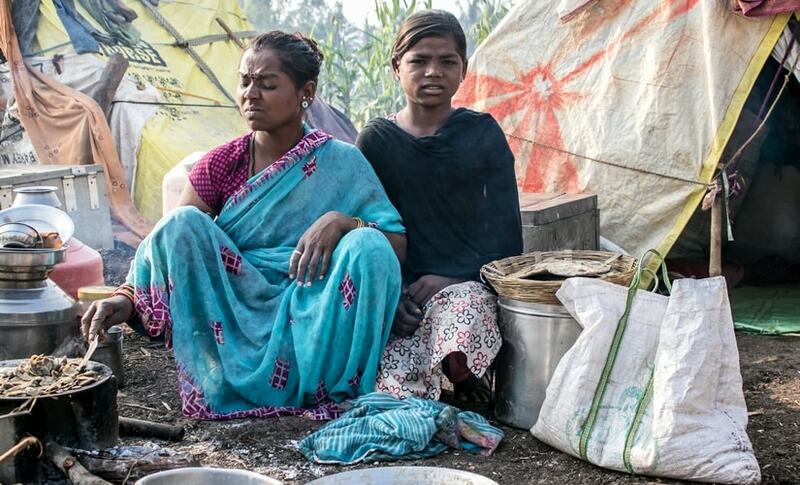 “I couldn’t leave my daughter alone in the village where you can’t even see a dog for six months,” says her mother, Sapna Jadhav, who is in her early 30s. Sapna’s son Rohan, 9, and daughter Mohini, 4, also travel with them. “There’s a lot of anguish, but what can be done about it?” she asks. Her parent also work as agricultural labourers in Beed taluk and are away from the village the entire day. “It was not possible for me to leave behind my children,” says Jadhav. Every morning she leaves for the fields at 9 and returns only by 9 at night. Damini, who’s in grade VIII, prepares food for the family and takes it to the fields. “When I came here I brought my school bag, but my dad took it back to the village two months ago when he had to return to the village for medical treatment,” she says. Dahiphal, with a population of 758, has a primary school [till grade IV]. The nearest secondary school is in Nalwandi village 3 km away and Damini walks the distance to and fro every day. “In the evening, it’s not safe to walk so my dad promised to buy me a cycle once he has enough money,” says Damini. Her father took an advance payment of Rs 50,000 from the contractor and is afraid that they won’t be able to cut enough sugarcane to repay it. For every ton of sugarcane, they are paid Rs 248. Ten families from Dahiphal stay in rickety sheds in an open field on the outskirts of Shirdhon village in Maharashtra’s Kolhapur district. In the harsh summer, Damini stays back with her siblings and a few other children. “I look after younger children. At times, I also go to the sugarcane fields. There is no one here to help me with my studies,” she says. Access to the sakhar shala (or sugar-factory school for migrants’ children) is a problem as the nearest factory is 14 km away. Moreover, every few weeks the families have to move with the sugarcane harvest. In the six-months season, the Dahiphal families have migrated to Karadaga and Galatga in Karnataka, and Hupri, Shirol, Pattan Kodoli and Shirdhon villages in Maharashtra. According to the 2011 census, 51 million people in India migrated for economic reasons. The National Sample Survey says 55.4 percent of rural migrants are illiterate. Over 48,000 students in Maharashtra were out of school, reports the 2017-18 state economic survey. Manisha Sonawane, 35, from Kesapuri village in Manjlegaon taluk of Beed district has been migrating for more than a decade. Two years ago, Manisha’s husband Anil worked as a watchman at a construction site in Pune. They were unable to support themselves on the Rs. 7,000 pay and they decided to cut sugarcane. “In Pune, the school ma’am used to take my eight year old son, Shubham to the school daily. I can’t keep him back in the village,” says Manisha. Shubham who is in class II wants to go back to the school. His 13-year-old brother and 11-year-old sister stay with their maternal grandmother in Devgaon village of Wadwani taluka in Beed. “They had to stay with my mother because we keep migrating for six months a year. We can’t afford to bring them with us at the cost of their education,” says Manisha. Every day the couple manages to cut three tonnes of cane. “Today, I am suffering from acidity, but I can’t stop working because we took an advance payment of Rs. 80,000,” she says. Manisha, who was married at 14, has never seen the inside of a school. She believes that education can break the cycle of poverty and migration. “I will educate all my children so that they never have to cut sugarcane,” she vows. Sania Tadvi, 13, is in grade VIII and belongs to the Tadvi Bhil tribe. Her day is no different from other migrant children. She collects fuel for the fire, cleans utensils, stores water and takes care of her siblings and cousins. “By the time we return to the village, the summer break will start.” Her uncle teaches her when he gets time in the summer holidays. Sania says that it becomes difficult for them to catch up with their classmates, and that breeds a feeling of inferiority and insecurity. She’s one of 18 children from nine families who have migrated 570 kilometre with their parents from Godri village in Jamner block of Maharashtra’s Jalgaon district to Kolhapur’s Nandani village. Sania’s mother, Roomshad, who is in her early 30s, couldn’t study beyond grade IX once married. Her 15-year-old daughter Naina, who is in grade IX stays with her aunt in Godri. Sania’s father, Pintu Tadvi, never went to the school. “My parents couldn’t afford to enroll me in a school. I’ve been working as an agricultural labourer from my childhood days,” he says. “I want to fulfill my father’s dream of becoming a collector,” smiles Sania.